In this article, we will learn important methods of ExecutorService interface with examples. The ExecutorService interface supplements execute with a similar, but more versatile submit method. Like execute, submit accepts Runnable objects, but also accepts Callable objects, which allow the task to return a value. The submit method returns a Future object, which is used to retrieve the Callable return value and to manage the status of both Callable and Runnable tasks. ExecutorService also provides methods for submitting large collections of Callable objects. Finally, ExecutorService provides a number of methods for managing the shutdown of the executor. To support an immediate shutdown, tasks should handle interrupts correctly. Let's list all the methods with a description here. boolean awaitTermination(long timeout, TimeUnit unit) - Blocks until all tasks have completed execution after a shutdown request, or the timeout occurs, or the current thread is interrupted, whichever happens first. List<Future> invokeAll(Collection<? extends Callable> tasks) - Executes the given tasks, returning a list of Futures holding their status and results when all complete. List<Future> invokeAll(Collection<? extends Callable> tasks, long timeout, TimeUnit unit) - Executes the given tasks, returning a list of Futures holding their status and results when all complete or the timeout expires, whichever happens first. T invokeAny(Collection<? extends Callable> tasks) - Executes the given tasks, returning the result of one that has completed successfully (i.e., without throwing an exception), if any do. T invokeAny(Collection<? extends Callable> tasks, long timeout, TimeUnit unit) - Executes the given tasks, returning the result of one that has completed successfully (i.e., without throwing an exception), if any do before the given timeout elapses. boolean isShutdown() - Returns true if this executor has been shut down. boolean isTerminated() - Returns true if all tasks have completed following shut down. void shutdown() - Initiates an orderly shutdown in which previously submitted tasks are executed, but no new tasks will be accepted. List shutdownNow() - Attempts to stop all actively executing tasks, halts the processing of waiting tasks, and returns a list of the tasks that were awaiting execution. Future submit(Callable task) - Submits a value-returning task for execution and returns a Future representing the pending results of the task. Future<?> submit(Runnable task) - Submits a Runnable task for execution and returns a Future representing that task. Future submit(Runnable task, T result) - Submits a Runnable task for execution and returns a Future representing that task. Let's demonstrates the usage of important ExecutorService interface methods with examples. 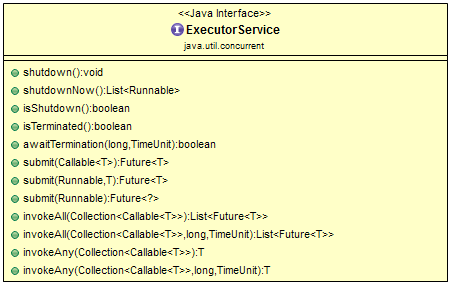 In this example, how to create an executor service and execute a task inside the executor. We use the Executors.newSingleThreadExecutor() method to create an ExecutorService that uses a single worker thread for executing tasks. The main difference is submit() method returns Future object for tracking the results but execute() method does't return anthing. Both submit() and execute() methods are used to submit a task to Executor framework for asynchronous execution. The submit() can accept both Runnable and Callable task but execute() can only accept the Runnable task. You can access submit() and execute() from the ExecutorService interface because it also extends the Executor interface which declares the execute() method. Let's use Executors.newFixedThreadPool(int nThreads) method creates a thread pool that reuses a fixed number of threads operating off a shared unbounded queue. In this above example, we have created 2 thread and executing 4 tasks. Look at the output only 2 threads pool-1-thread-1 and pool-1-thread-2 are reused for executing 4 tasks.